Can we teach technological entrepreneurship? Professor Dan Shechtman’s answer: “Yes, we can – and we should”. Shechtman, an Israeli Nobel Prize winner in chemistry who has many other strings to his bow, gave the opening presentation at the seventh Sofia Science Festival, which is on until May 14. He sketched out a world of struggling economies, population growth problems – too many children, or too few – internal wars and refugees. Technological entrepreneurship, he said, was key to world peace and prosperity, because all the countries in the world that had serious problems had it in common that they were poor, with consequently disenchanted populations. Encouraging technological entrepreneurship – which he defined as “the establishment of a new technology venture” – would be a solution to low GDP per capita, and to employment, though he added the rider that startups produce jobs for the educated. “Only the educated will be able to survive in the future,” Shechtman said. A sustainable economy depends on entrepreneurship in general, he said. The only sustainable natural resource was human ingenuity. For a country to develop human ingenuity required a good education system, providing a good basic education system for all. The principle agreement should be that as a government provided a good education, parents should be sending their children to school. “And the law should be enforced”. 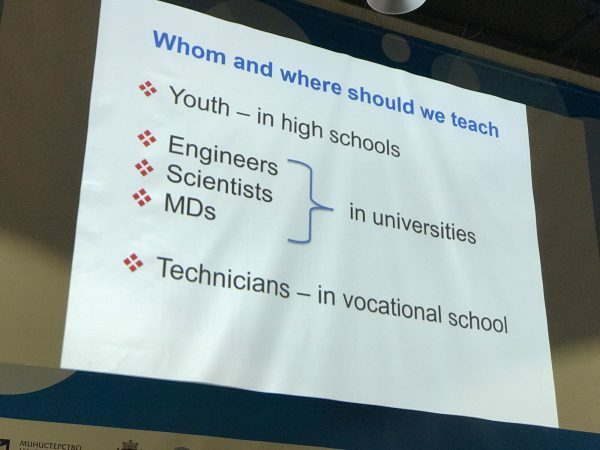 “Teachers are the most important people in the world,” Shechtman told the large audience, adding that teachers should be well-compensated, with good salaries. Also needed was the development of an entrepreneurial spirit and knowledge. “Can we teach technological entrepreneurship? Yes we can – and we should,” said Shechtman, who has been teaching the subject at the Technion in Israel since 1986. By now, about 10 000 students, mainly engineers and scientists, have attended the courses. It was engineers, MDs, scientists and computer experts that opened startup companies, he said. Technological entrepreneurship could be taught in high schools, introduced to people 16 years old. 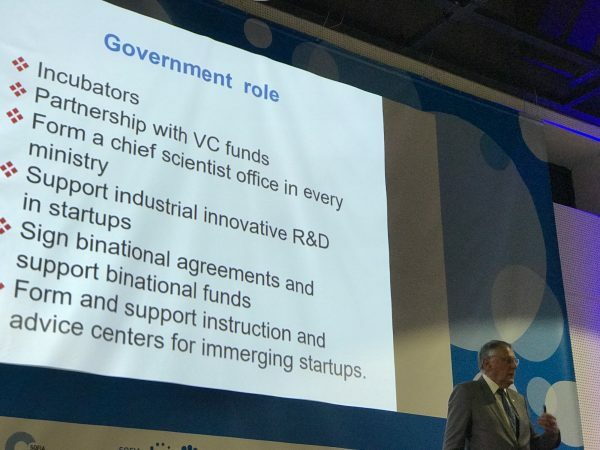 In the time that Shechtman has been heading his course, Israel has become a startup nation. Twenty-five per cent of graduates of his classes went on to found startups. His classes are open to all Techion students. There are 300 to 600 students each year, and all lectures are given by invited speakers, of three categories – successful entrepreneurs, new startup entrepreneurs (those about five to six years in) and professionals, such as lawyers. The first group explain how they succeeded and the challenges they face, the second explain their struggles, their problems and how they overcome them, and the third dwell on essential practical matters, such as what a limited company is and the need to found one, how to protect intellectual property and how to do market survey. Shechtman also outlined some of the key mistakes that can lead to the failure of startups. These include non-professional management by the tech entrepreneur, he said, underlining that when a company grows past a certain point, it likely would be necessary to hand over to a professionally-qualified manager. Another reason for failure was insufficient market survey and lack of knowledge of the market. A further risk was a bad contract among the founders. Every possible scenario should be provided for, he advised, telling his audience that at the outset, the founders should hire the best lawyer in town, to forestall problems in the future. Shechtman said that there were cultural considerations, such as the fear of failure and the severe social stigma that could go with it, especially in some cultures. “You don’t have to learn by your own failures. You can succeed by learning from other people’s failures,” he said. Shechtman also advocated intrapreneurship, entrepreneurship within a company. “Every company has an untapped resource of knowledge and bright new ideas”, and these were among the employees. In Israel, he said, the CEO made his mobile phone number available to everybody. He emphasised the importance of early science education. In Israel, already science kindergartens had been founded, with qualified scientists leading classes among pre-schoolers. 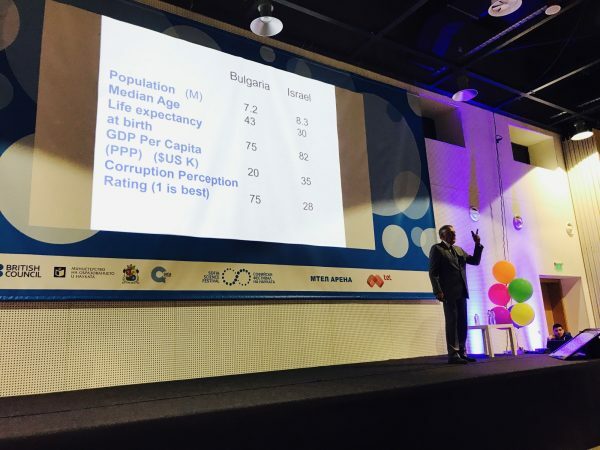 Professor Shechtman’s lecture was organised in co-operation with the embassy of the State of Israel in Sofia. For further details of the Sofia Science Festival programme, which continues until May 14, and on how to buy tickets or reserve free seats, please visit the Festival’s website. The Sofia Globe and Bulgaria Now are media partners of the 2017 Sofia Science Festival.